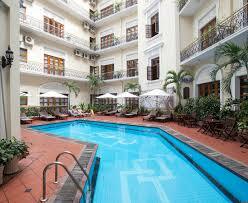 Welcome to Hotel Majestic Saigon! 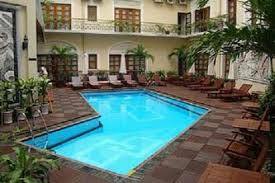 The Hotel of Heritage – Hospitality – Elegance! 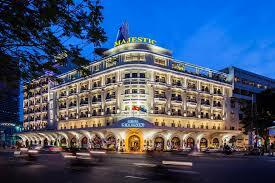 Since 1925, situated on the strategic location of Ho Chi Minh City with the stunning views of the Saigon River, the 5 – star luxury heritage Hotel Majestic Saigon has been one of the best city’s landmarks. On the picturesque riverside corner of Dong Khoi and Ton Duc Thang street, Hotel Majestic Saigon has remained faithfully to the original classical French colonial architecture and interior design. The 5-star Hotel Majestic Saigon harmonizes a unique heritage concept with luxurious accommodation, fine dining restaurants, high-class facilities and legendary service. The Majestic Saigon provides the perfect companion to your stay in downtown of Saigon, either for a business meeting, a magical holiday, or a romantic wedding and honeymoon. A wide range of 175 deluxe rooms and spacious suites featuring full marble bathrooms, private room balconies, high-end amenities will bring you an extravagant and comfortable relax in style stay. M Bar – one of the top ten rooftop bars in Saigon, is a must for our signature cocktails and enjoy the spectacular views of Saigon River by night in the relaxed music tones by our daily live musicians. Or give yourself a nice retreat from the hustle and bustle of city life at the Merry Pool Bar and enjoy a refreshing complimentary poolside delight. Alternatively, you can indulge yourself in the cozy atmosphere filled with the romantic airs of the piano songs whilst sipping a refreshing drink at Catinat Lounge. You also can wine and dine in style at our Cyclo Café and experience our signature Vietnamese Cuisines in town, or discover the city by night and savor the taste of fresh seafood BBQ Buffet at our Sky Bar. During your stay, you can visit some of the city’s famous landmarks just a few minutes away from our doorstep. For a change of pace, take some city sightseeing tour or join in seasonal events that surely will make the most of journey. An ideal place for rendezvous, reading newspapers or having a chat. Indulge yourself in the cozy atmosphere filled with the romantic airs of the piano songs whilst sipping a refreshing drink. Catinat lounge also offers complimentary wireless Internet access for your convenience. An ideal place to enjoy the spectacular view of the Saigon River, Breeze Sky Bar is an all-day alfresco dining venue from Daily International Buffet Breakfast, Barbeque Buffet Dinner to delectable À la carte menu assorted with a large selection of beer and wines. One of the top ten rooftop bars in Saigon, is a must for our signature cocktails and snacks. 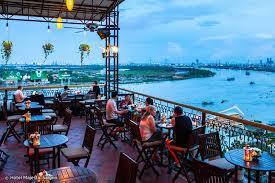 Renowned as a destination to catch up with friends for a coffee or drink while enjoying the unrivalled views of the Saigon River at sunset and night time. 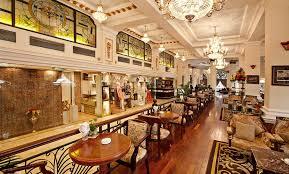 Live entertainment including Philippinos and Flamenco Band takes place in the Bar daily. Located in the heart of Saigon, on Dong Khoi St., Hotel Majestic Saigon provides an ideal location, an unique and flexible space for business meetings, weddings, receptions, banquets, parties and retreats. Please view our Wedding Brochure and Function & Meeting Brochure for additional rental information. Location: Both new and classic wing throughout the hotel. Décor: Warm and luxurious wood toned with classical Colonial French Style. Hospitality Service: Welcome fruits, flowers, daily Newspaper, and turndown service. Baby crib is available free of charge (only for baby under 24 months old). Deluxe rooms can accommodate up to 2 guests. Bathroom features: One bathroom with bathtub, stand-up and rain shower, make-up mirror, hair dryer, bathroom telephone, luxurious terry cloth bathrobes and slippers. Amenities: Air-conditioning, LCD TV with national and international channels, CD/DVD player, Wi-Fi free, Alarm clock/ Radio, in-room safety box, writing desk, telephone, minibar. View: Dong Khoi St. or Nguyen Hue St.
With a quiet and fresh space, Colonial Pool Deluxe featuring the balcony overlooking the pool will be perfect for those looking for luxurious comfort with a touch of tranquility in the heart of Saigon. Location: Classic wing in the hotel. The only hotel owns the balcony overlooking Saigon River and offers full of high quality facilities, this will bring a unique and memorable experience for guests especially for the newly wed couples. View: Panoramic view of Saigon River. 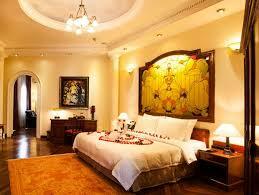 Deluxe rooms can accommodate up to 3 guests. View: City view or Swimming pool view. Decor: Warm and luxurious wood toned with classical Colonial French Style. Amenities: Air-conditioning, LCD TV with national and international channels, CD/DVD player, Wi-Fi free, Alarm clock/ Radio, in-room safe, iron/ ironing board, coffee maker, writing desk, telephone, minibar. Colonial Majestic Suite is the perfect choice of a luxury accommodation with the most impressive panoramic views of Saigon River. Featuring a living room and a separate bedroom with a working desk, these one-bedroom suites are perfect for guests looking for a little more space. Bathroom features: One bathroom with bathtub, stand-up and rain shower, make-up mirror, hair dryer, bathroom telephone, luxurious terry cloth bathrobes and slippers. Amenities: Air-conditioning, LCD TV with national and international channels, CD/DVD player, Wi-Fi free, Alarm clock/ Radio, in-room safe, iron/ ironing board, coffee maker, writing desk, telephone, minibar.